Three views of the Vela region: the	ROSAT image in the 0.1-2.4 keV range (left) shows the huge Vela supernova remnant, with the smaller Puppis supernova remnant in the upper corner. An image in high-energy photons >1.3 keV (middle,	Aschenbach et al. 1998) reveals yet another supernova remnant, Vela Junior or RX J0852.0-4622, and exposes the Vela pulsar more clearly, near the center of the image. The enhanced X-ray emission south of the pulsar is known as the Vela X nebula. The sky image to the right was taken at TeV energies with H.E.S.S. ; the old Vela supernova remnant does not show up at the these energies, but the circular young Vela Junior remnant is clearly visible (see also March 05), as well as this month's topic, an extended emission region south of the pulsar, coincident with Vela X. 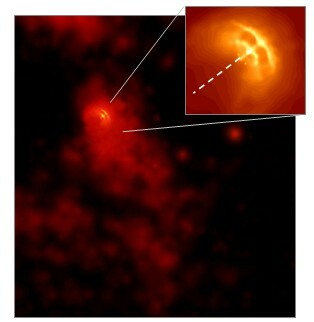 The two gamma ray sources in Vela are the nearest known cosmic "Tevatrons". About 10000 years ago, at a distance of about 900 light years (Dodson et al, 2003), at the edge of what is now the "local bubble", a supernova explosion took place in the constellation of Vela. The resulting supernova remnant, well over 100 light years in diameter, is best seen in X-ray images (top left), but is also visible inoptical images. At the center of the remnant is the left-over stellar core, collapsed into a 12 mile diameter, a rapidly spinning neutron star - theVela pulsar. ROSAT hard X-ray images revealed extended X-ray emission south of the pulsar (Markwardt & Ögelman 1995, alsoLu & Aschenbach 2000), most likely of nonthermal origin (see also middle image above), and coincident with a bright radio feature labeled Vela X (other radio features being called Vela Y and Vela Z by Risbeth, 1958). Later observations with Chandra (Fig. 1) resolved the detailed structure in the vicinity of the pulsar and show that Vela X cannot be associated with a jet emerging along the pulsar's spin axis; the asymmetric X-ray emission could result from a pulsar wind nebula offset from the pulsar due to ambient pressures (see September 05), or reflect enhanced magnetic fields and therefore increased synchrotron radiation. H.E.S.S. observed the Vela X region in 2004 and 2005 for a total of 16 h, resulting in a strong gamma ray signal of about 2000 events (about 16 sigma) from an extended source south of the Vela pulsar, coincident with Vela-X (Fig. 2). The source region is elongated, and well described by a Gaussian profile of major axis 0.48 degr. and minor axis 0.36 degr. ; its orientation is almost perpendicular to the pulsar's jet. The spectrum of gamma rays is among the hardest detected so far, with a spectral index of 1.45, meaning that the spectral energy distribution (SED) - the amount of energy radiated per logarithmic interval of energy - rises with gamma-ray energy (Fig. 3). 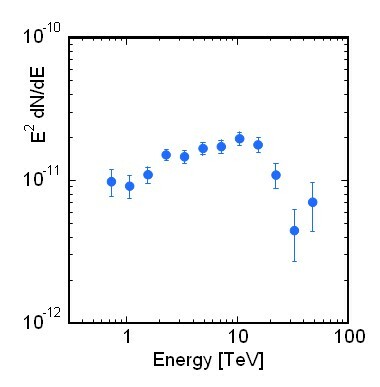 At high energies, the spectrum turns over, resulting in a peak of the SED around 10 TeV. Such a peak is characteristic for gamma-rays produced by inverse-Compton up-scattering of ambient photons by high-energy electrons, but for all other known gamma-ray sources, the peak is below the energy range covered by Cherenkov telescopes, and it's existence can only be inferred indirectly. The gamma-ray data demonstrate conclusively that Vela X is indeed a nonthermal phenomenon, and that high-energy particles are confined to the region of the Vela X nebula. In the inverse-Compton model, to maintain the gamma-ray flux which is equivalent to 50% of the flux from the Crab Nebula, the primary electrons must have a spectral index of 2.0, and contain about 2 x 1045 ergs of energy, in electrons between 5 and 100 TeV. Fig. 1: Chandra view of the Vela pulsar (small inset) and of the	Vela X nebula south of the pulsar. The high-resolution Chandra image shows clearly that - contrary to earlier assumptions - the X-ray nebula does not line up with the pulsar axis, which is indicated by the dashed line. Fig. 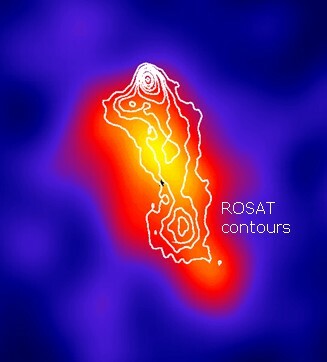 2: Intensity of very high energy gamma rays (color scale), with superimposed ROSAT X-ray contours. The gamma ray emission extends over roughly 1 degree. While the Vela pulsar is clearly visible in X-rays, no excess is seen in gamma rays. Fig. 3: Spectral energy distribution of the VHE gamma rays from Vela X. Most of the energy is emitted in the interval around 10 TeV. Vela X is the first source where the spectral energy distribution peaks at TeV energies.